I managed to get out last night for my first deer stalking trip this year. We had had 23mm of rain overnight and in the morning and the forecast was for it to clear for the afternoon evening. I was at the bush edge about 5:30 pm and the visibilty was good but things were damp. I was looking too far ahead and missed seeing three deer down to my left until they started to move off. I was a little bit annoyed as they would have been real handy to camp, but I figured if they were out already other deer would be too. Another few hundred metres and I was at the top of a ridge leading down in to a very productive gully. 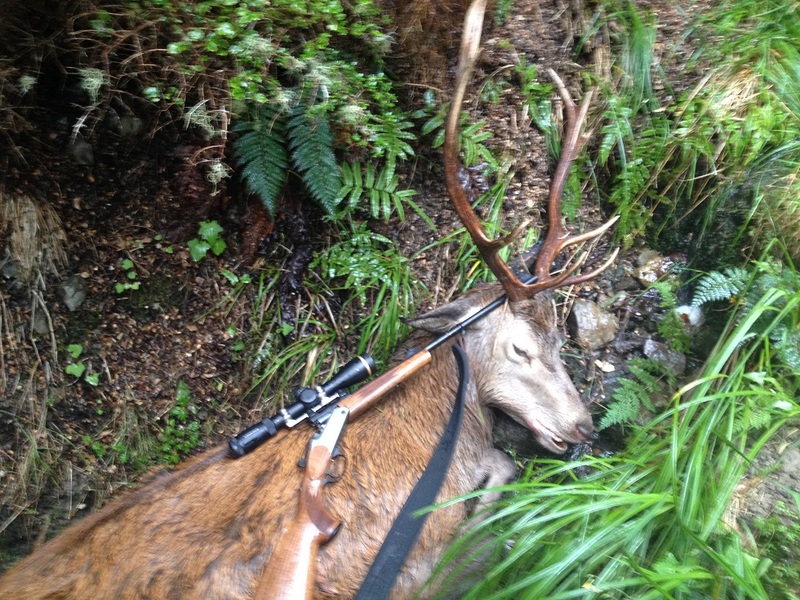 A quick scan of the slopes picked up a stag sitting on a clearing in amongst some beech. I crawled down 20m to where I could get a good shot from. I ranged him at 365 yds and turned the phone on to enter all the data. While I was waiting for it I spotted 2 other deer lower down on the same face. Pretty soon I was ready for the shot, but I missed and the stag stayed sitting there ( I had remembered on the way in that I hadn't put any patches through the barrel to take the oil out). Reloading as fast as I could I managed to get another shot as he stood up. At the shot he bolted forward and out of sight. I sat and watched to see of he would come out, I saw another smaller stag about 100m closer, but the original stag never came out of the beech he ran into. About 20 minutes later I had made my way to where the stag had been lying. I had a good look for blood but couldn't find any, but I could make out the odd print in the direction he had run. The prints lead towards a really tight little stream with really thick bush/scrub around it. I couldn't see a deer going through that so I dropped down to the right through an open swampy gully. About 20m down there was a game trail leading back across the stream, pausing at the stream I looked up and there was the stag lying dead in the stream. I took a few photos where he lay and then moved him down to the game trail to cut him up. 1.5hrs later I had him cut up and in the pack ready for the carry out. Steve338, sako75, outdoorlad and 17 others like this. well done, whats the rifle ?? I like that. Good job with the K95 Stu. @gonetropo a Blaser K95 standard model chambered in 7x65R (the rimmed version of the 7x64). Here was me thinking it was just a Baikal or something. Great read, nice work. How do you find follow up shots with a single shot compared to a bolt action? Follow up shots are a bit slower, and you need to take the rifle off the shoulder which means you need to re-set for the shot. This is the fourth deer I've shot with the K95, and the first that needed a second shot. Good to be on the board for the year, plenty of good pre roar venison too.